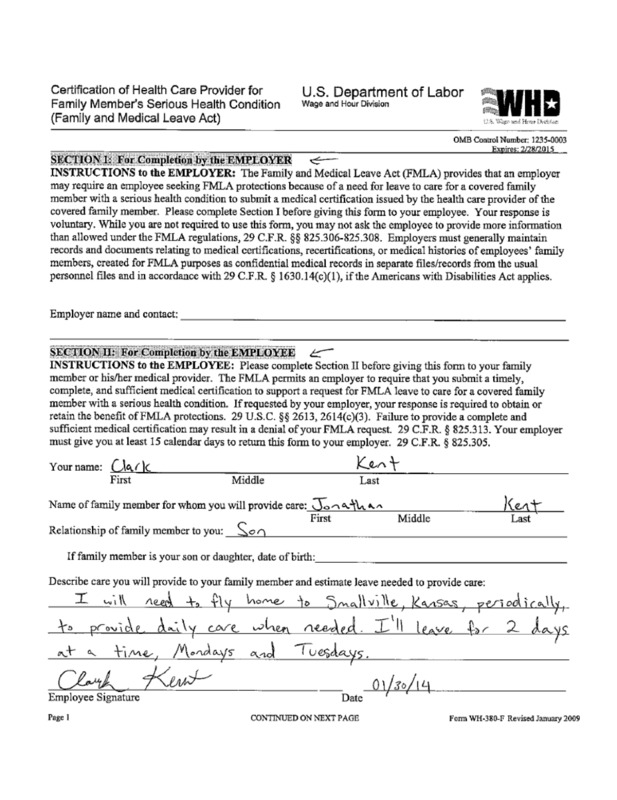 If you are taking leave for a family member's serious health condition, you will find the form (WH-380-F) here. Before going into detail over the forms, it's useful to note some preliminary points. The FMLA certification is written to be sufficiently vague, so that HIPAA laws are not violated. You can answer the questions providing only an estimation of treatment and/or absences. This information cannot be reliably linked to specific diagnoses unless specifically stated. The goal then is to be as vague about the condition as possible while providing as much detail on the absences from work as you are capable of. For the love of science and medicine, do not, please, do NOT tell me that you aren't a mind-reader/fortune-teller/genie. In your expert medical opinion, drawing on however many years of experience, guess. Typically, the paperwork can be adjusted and resent later. Of course you should be as precise as possible, but employees often have deadlines for paperwork once their case is reported, along with deadlines to report their medical issues requiring absence. This means that a surgery date for example can be scheduled far in advance. The employee needs to alert their employer ASAP. They then have 15 days to get supporting paperwork to the company, a deadline provided by the employer. 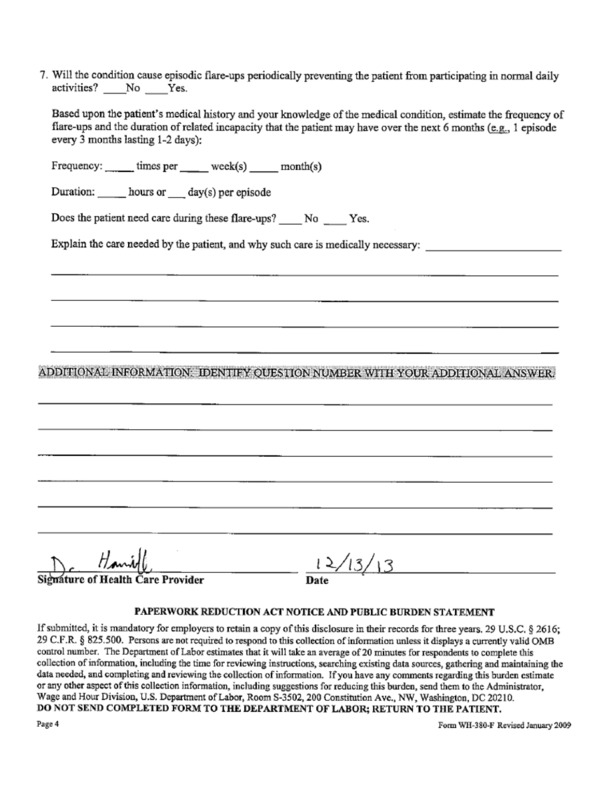 You would need to certify the date of surgery and the recovery period. 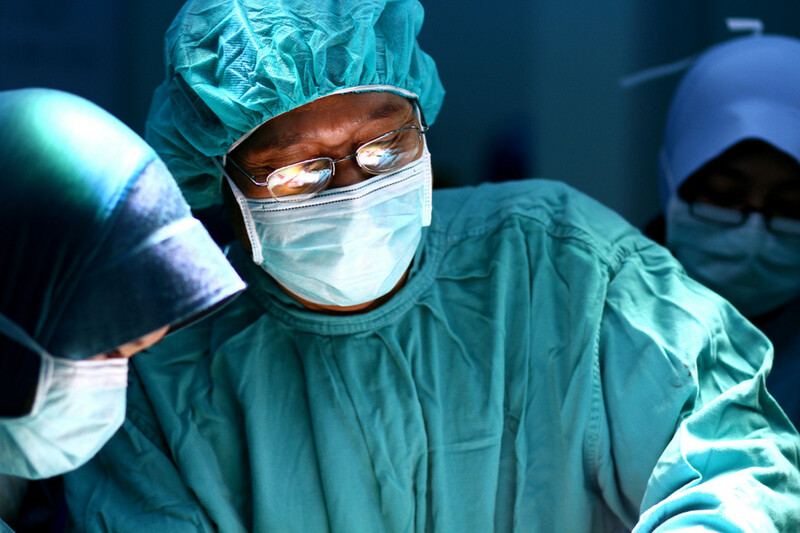 The recovery period is dependent on how well the surgery goes, and every patient is different. However, it's common that a hysterectomy requires 6-8 weeks of recovery time. Guess for 8 weeks! 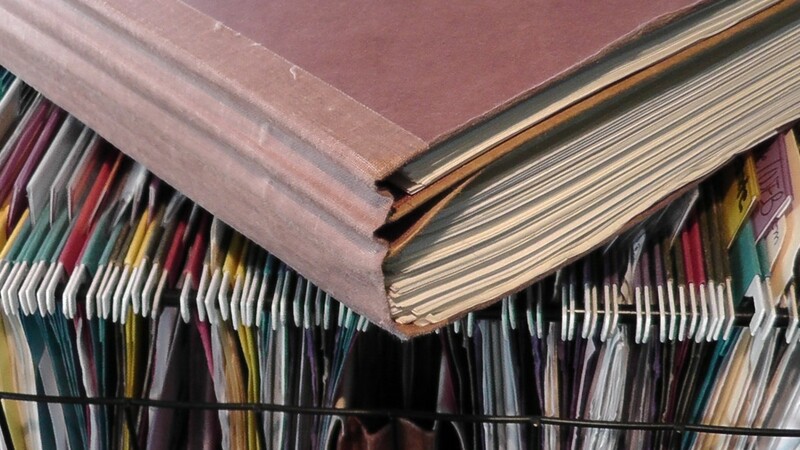 If you feel uncomfortable, certify for 1-2 weeks post surgery, then adjust the paperwork for additional time as needed upon the follow up appointment. Pregnancy: you can put the estimated date of delivery and adjust the paperwork once the baby is born. Migraines: of course you can't know when a patient will have a migraine, but you do have access to the patient's medical history. The patient may report a migraine twice a month on average. You can put 2 "episodes" (migraines) per month. Asthma: same as above, ad nauseum. Keep in mind that if the employee exceeds their frequency, the employer may ask that they re-certify. This means that you will need to either confirm their previous frequency or increase it. You may want to give an overestimation as much as you feel is comfortable and correct. Continuous Leave of Absence: one block of time, generally considered to be 3+ days. You can have multiple, consecutive continuous leaves. Intermittent Leave of Absence: Any regular interval of absences that don't follow a schedule. This can mean an hour appointment once a month or even several days a year. 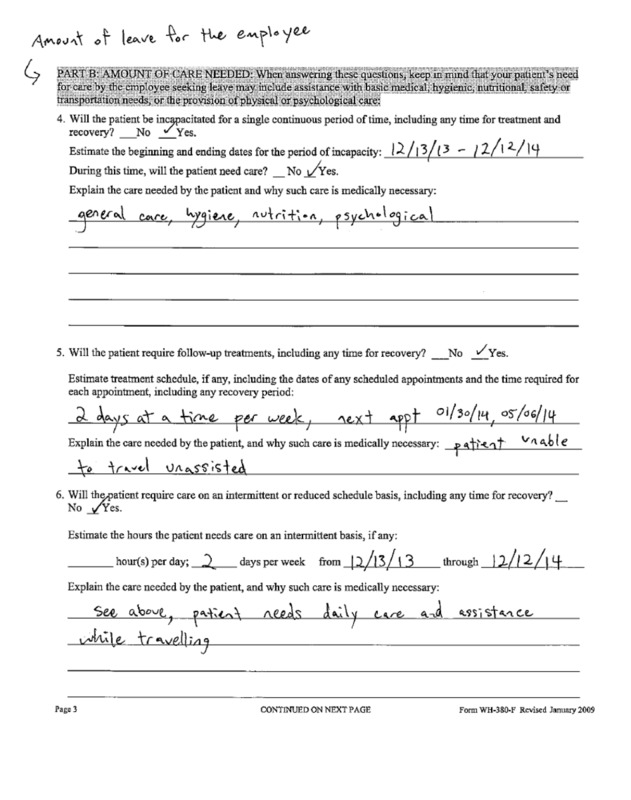 Reduced Leave of Absence: When leave is scheduled, similar to intermittent leave. This can be when employees can only work 4 hours a day maximum, miss every Monday/Wednesday, or similar. Section 1 and section 2 are not to be completed by the healthcare providers. You can put the date you began treating the patient, but it is best to put what is in their medical history. Part A covers basic medical information, when you treated the patient, when the condition began, etc. Regarding Part A, section 4, this is often left blank because healthcare providers feel uncomfortable releasing this kind of information. 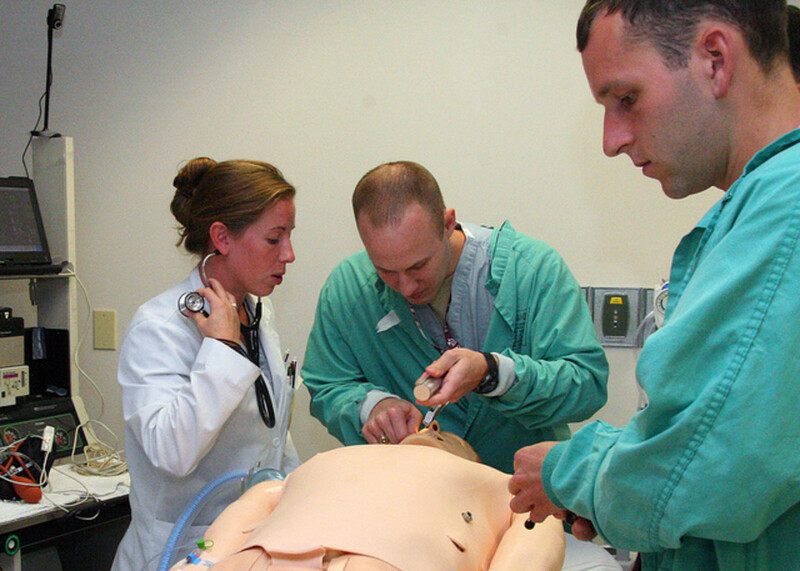 However, this can be an area to identify specific needs for the patient. Some employers look so carefully at the amount of leave taken that employees have been penalized for "excessive bathroom breaks". During pregnancy, this is often a concern. You can put information like this here. Part B is the most important part, particularly section 5; it certifies the block of leave needed for the surgery. The only special part about this is that the doctor has certified for appointments, both pre-op and post-op. This is an intermittent leave, which will be covered in more detail below. For continuous leave, all that really matters is section 5. 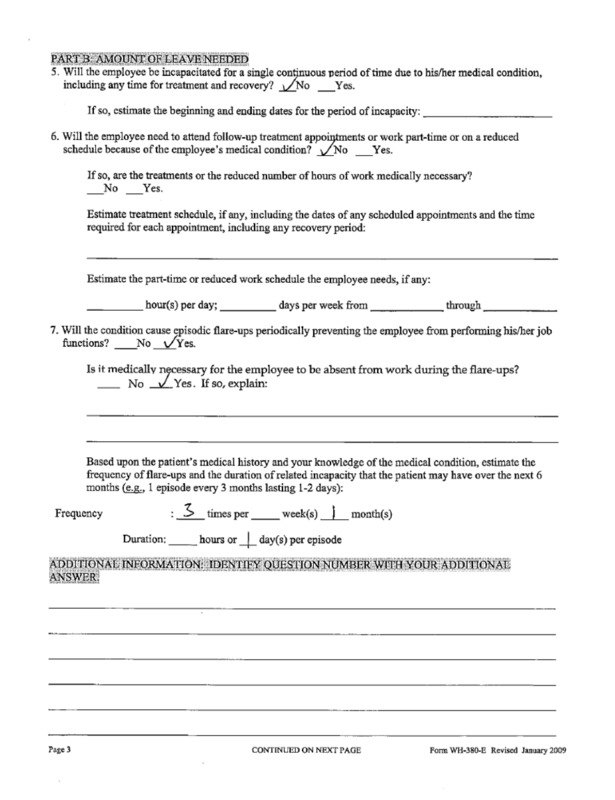 The form is the same as this is for an employee's own health condition. 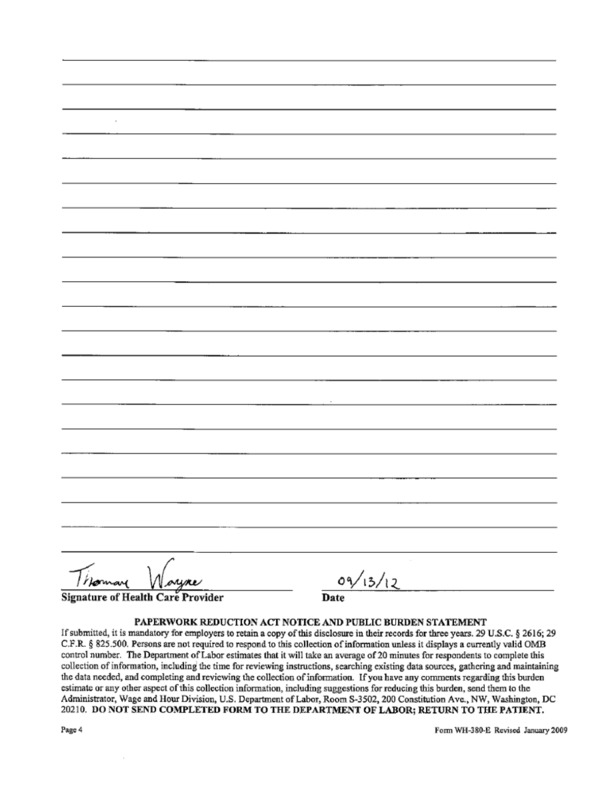 The first page is general information not required to be completed by the healthcare provider. Note the approximate start of the condition, this can sometimes be the date you started to treat the patient, and you may make this explicit in the details. "Probable duration of the condition:" The condition is asthma, and in this case, the condition is lifelong. 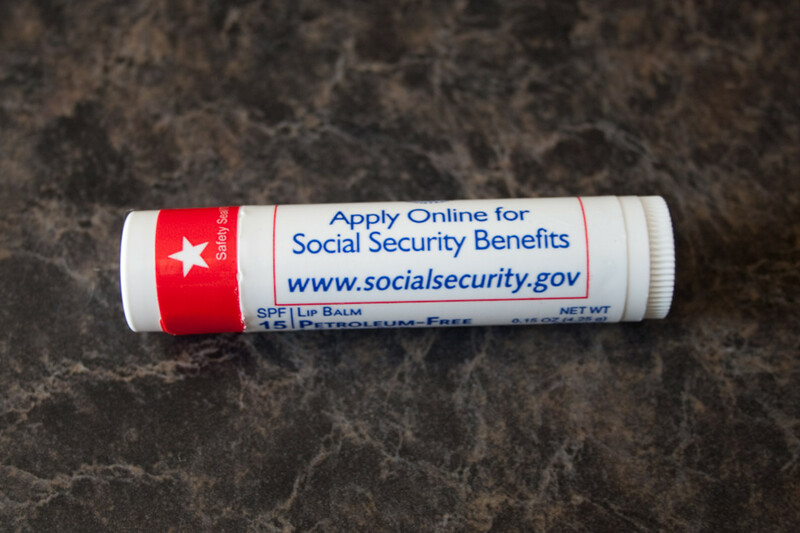 Some companies don't mind if you put lifelong, others do. 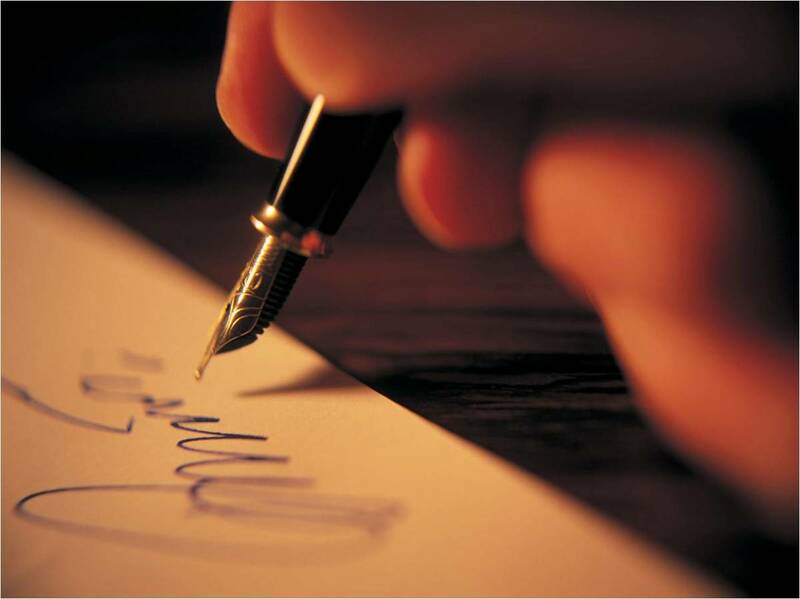 The law gives a guideline of one year for all paperwork. To avoid trouble and re-certification, you can put '1 year,' or better yet, a specific date. If you wish to be clear, you can indicate that the condition is lifelong. Use the additional space for more information if you feel it is needed. There's no need to state the condition. You can also discuss this with the patient. Most companies will accept previously completed FMLA paperwork with minor changes. For example, you could scratch out the frequency listed under section 7 and write a 5 instead of 3. 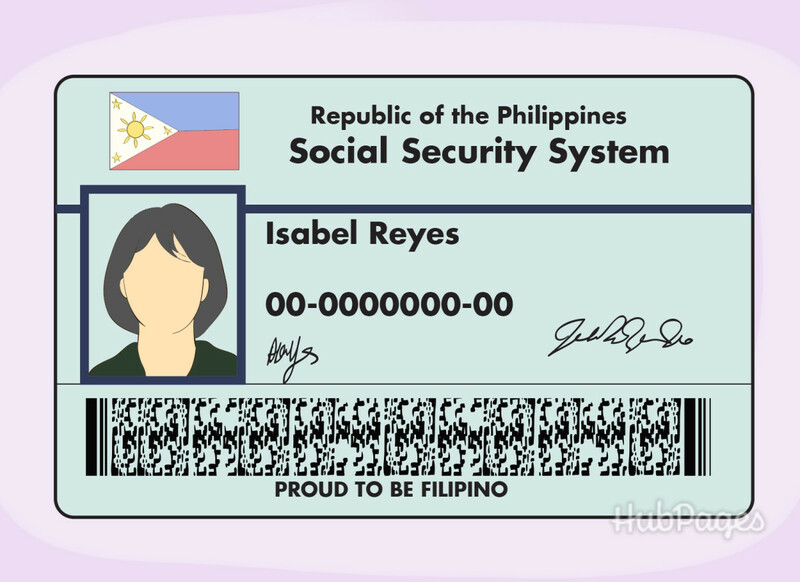 You could then initial your name next to the change and resend the documents. In some cases however you will need to complete new paperwork. Section 5 is for continuous leave, and isn't needed for intermittent leave. Section 6 hasn't been completed, because the leave from work will be random due to asthma attacks. Also, treatments and appointments can be scheduled around work, so no appointments are certified for. This section could be completed if appointments are necessary, in the same was as section 7. Section 7 is for flare-ups, such as asthma attacks, migraines, low blood sugar, etc. Here it is listed as 3 times per month, lasting one day. This can easily be changed to 3 times per week, or 3 times per 2 months. If you'd like to note anything special about the leave taken, such as different time intervals, please do so in the notes. 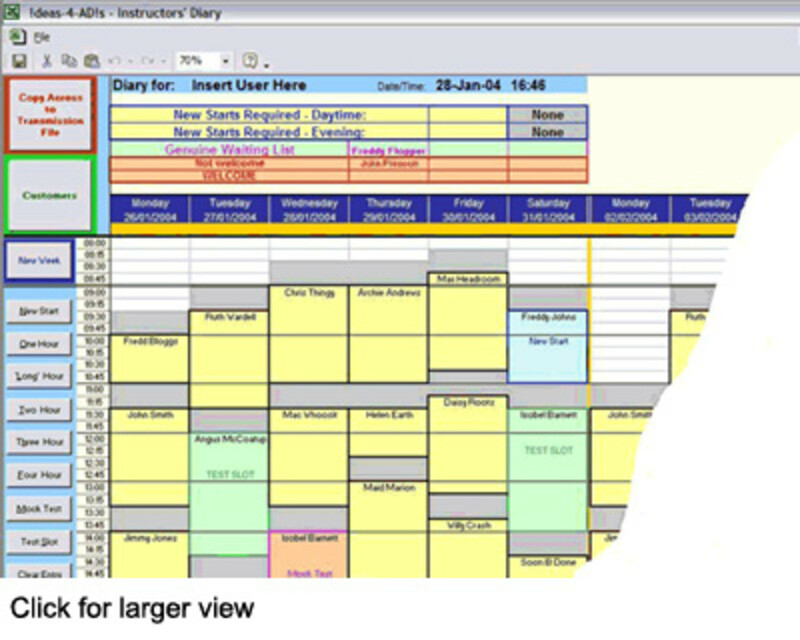 Reduced schedules are a mix of continuous and intermittent leave. The leave is known ahead of time but is generally less than 3 days. This is helpful when you know the patient shouldn't stand for more than 4 hours a day, then they will need to be reduced to working part-time, 20 hours a week. There can also be intermittent leaves plus reduced leaves. When making a determination, if it can be planned, make it reduced. If it's spontaneous, make it intermittent. *For more on determinations, see below. 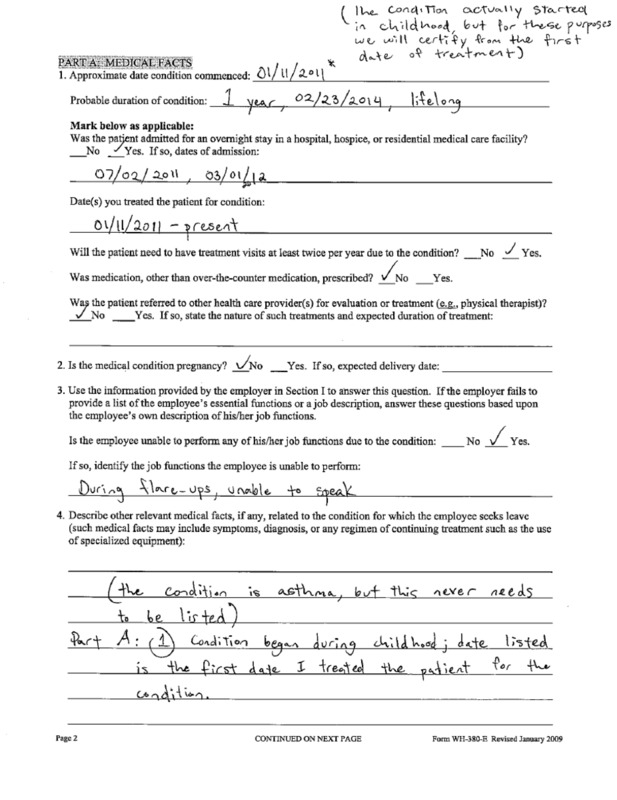 In this case, the patient has listed the situation, and the doctor is agreeing to what's requested. This may make you uncomfortable as the healthcare provider, because you are certifying for the patient's caregiver and not for the patient, them self. However, this is what is expected under the law. You can simply certify what kind of care is likely needed for a patient with that condition. Even simple tasks such as bathing, feeding, etc. can be given an estimated amount of time. Try to think of it in these terms, and you should be able to medically justify any leave the caregiver truly needs. We certify the start date as 12/13/13 and the end date as 12/12/14, i.e. one full year. We can do this even though we may need to renew for another year, or sadly, even though the patient may pass away after a few more months. You may choose to leave section 3 blank. The most important thing to remember about this section is that you are completing it for the caregiver, the employee, not the patient. 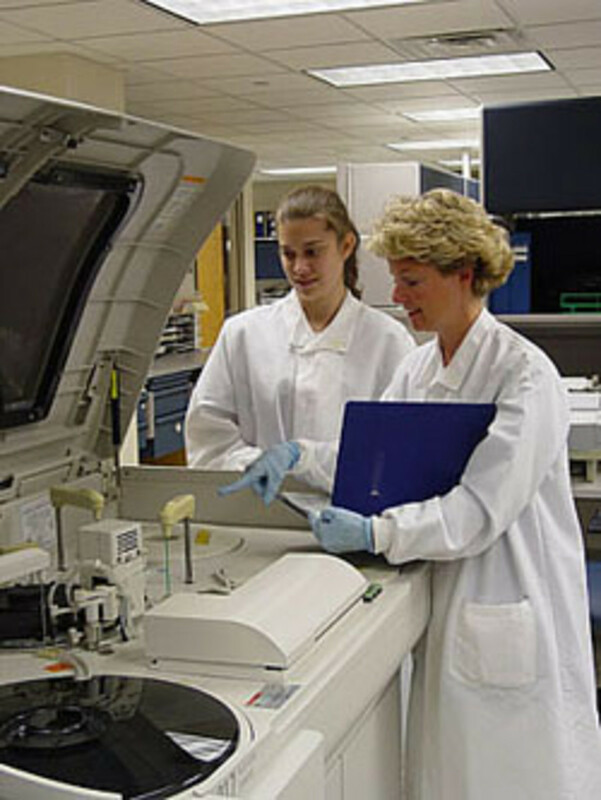 You will need to use the medical facts surrounding the patient to certify leave taken. Estimating the dates of incapacity: this will be the length of time the employee will be allowed to take leave. "During this time, will the patient need care?" If you check no, the employee will be denied leave, because you've said the patient doesn't have a severe enough need. "Explain the care needed by the patient and why such care is medically necessary." Here, you may wish to list all daily needs if the patient is so incapacitated, e.g. bathing, transportation, feeding, etc. It can be as simple as "transportation to appointments." You can also list it as medically necessary for the patient's recovery. This section will depend on how critically the company examines the medical certification. This section concerns treatments and appointments. Whenever the patient is receiving this type of care, it should be listed as closely as possible. For example, the caregiver may need to drive home to administer an insulin shot. This can be listed based on how many times a week the shots need to be given. The caregiver may need to drive home from work to deliver them. This is regarding episodes of incapacity, a flare up that occurs suddenly. See the example given. 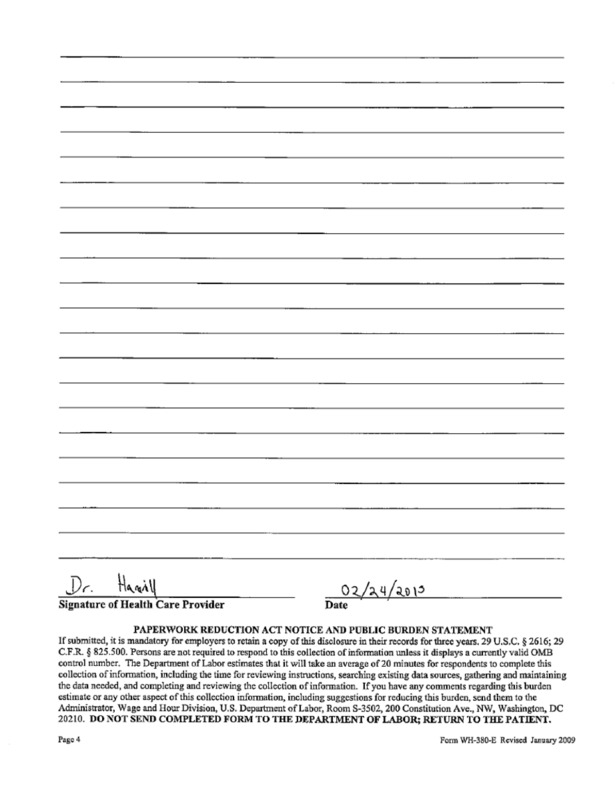 You may also like to look at the intermittent leave for the employee's own health condition. This section is for emergency situations, such as asthma attacks, low blood sugar, etc. For this leave, it isn't necessary. In other situations it may be, so please see above under "Intermittent FMLA Leave" for examples. Anything you feel should be known. There is no need to list the condition here. 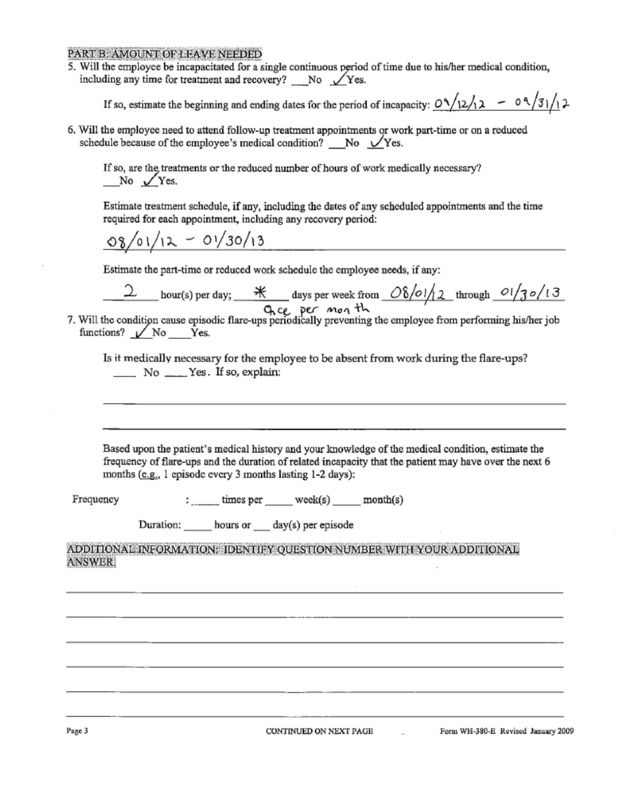 The Department of Labor forms aren't necessary to approve FMLA, legally. Many companies will accept multiple forms or offer their own. The main concern is getting the information communicated. Some companies will accept the information if it's legible on a napkin! You can use the above forms and examples as templates. 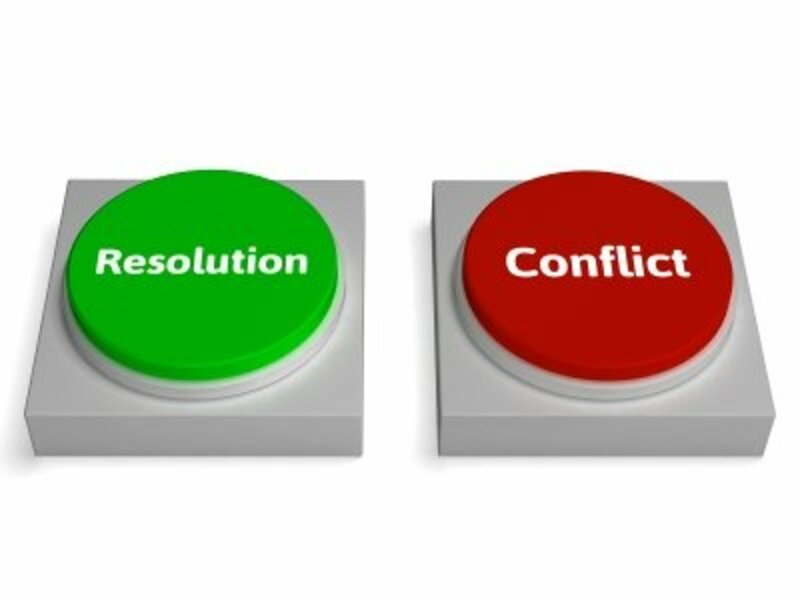 Every situation is different, but as long as common sense is exercised with an eye towards the needs of all parties involved, everything should be fine. If you have intermittent fmla and the doctor fills in the estimated time as 2-3 times per month 1-2days per episode is that the only amount of time you are allowed to miss? What if your doctor includes patient need off work when flare up occurs? My employer is telling me i can only use if 6 times a month. I thought i could use up to 12 weeks per 12months. My father fell 30 feet from his roof. He suffered multiple traumatic injuries. He has been back and forth between the hospital and rehab for the past 2 months. He tentatively will be discharged home in a few weeks. He will need almost total care at home. He lives 10 hours away and his wife needs help with caring for him. I applied for fmla. None of his doctors will fill out the fmla form so I can help with his care. However they did send his history and physical for my family doctor to review in order to complete the paperwork. 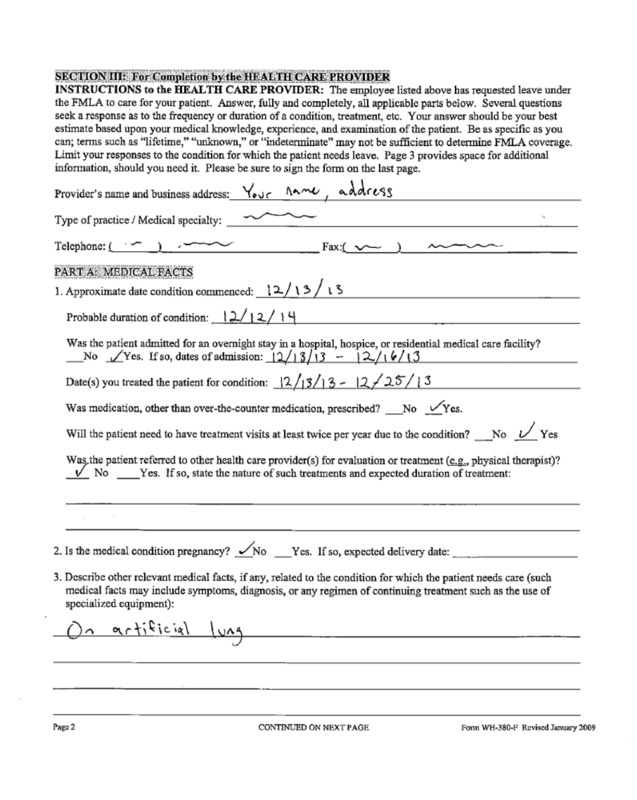 My doctor had no problem completing the fmla form. 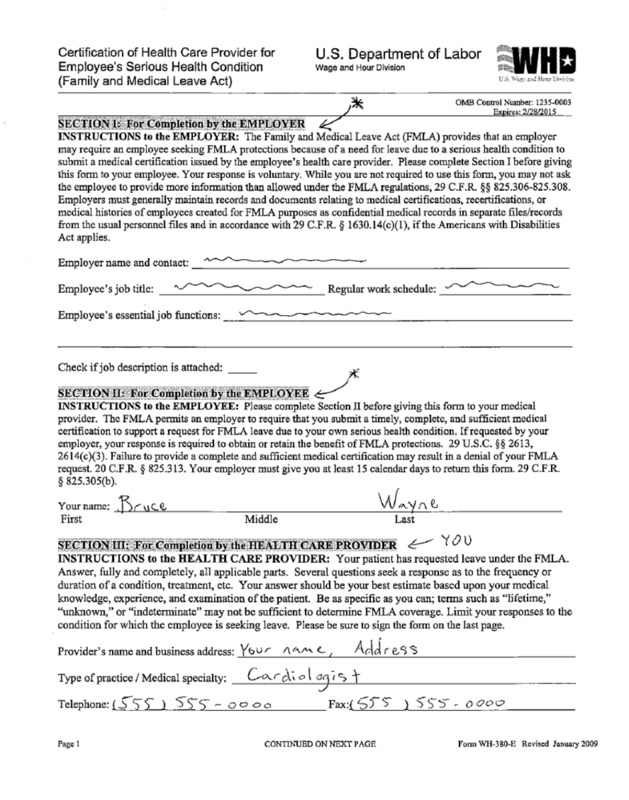 However, my employer is denying me fmla because none of the treating physicians completed the form. What do I do now? I'm very sorry to hear that. FMLA is designed for when leave is medically necessary, so the doctors might not feel comfortable completing the paperwork. I would suggest continuing to discuss with the doctors and administrators. 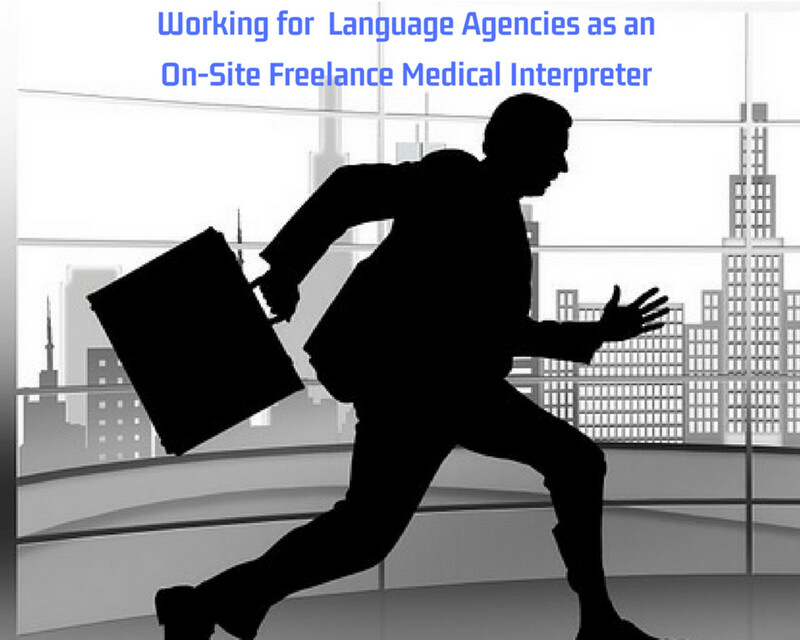 If you have the means, you can also transfer the patient to another facility or new doctor. If the patient has a primary care doctor who is more understanding, you can try having them fill out the paperwork as well. I would check with your HR on what form they want for bonding time. You are entitled to this time under law, and you should take it! I would think the form should be WH-380-F, leave for a family member. Make it explicit that this is for bonding time/taking care of the child. I would suggest continuing to discuss with the doctors and administrators. If you have the means, you can also transfer her to another facility. If she has a primary care doctor who is more understanding, you can try having them fill out the paperwork as well. I NEED HELP!!!!! I made the decision to place my mother on hospice care at the nursing home where my mother is living in February this year. I applied for FMLA from my employer and they sent me the paperwork right away. My problem is with the nursing home. The administrator there ( Becky) says the doctor is refusing to fill out the paperwork because belair is taking care of my mother not me. I explained to her that the I am not taking s leave of absence to care for my mother or am I taking over as caregiver. The FMLA is for the days when my needs the emotional support only family can give and to protect me from losing my job for calling off to offer that support. The Administrator is still refusing to have the paperwork filled out and now the paperwork work has disappeared and no one at the nursing knows what happened to it so I have to start the process all over again. I called hospice to see if they can help and I am still waiting for a answer from them. I just don't know where to go from here. IM SM SO LOST AND FRUSTRATED!!!!!! Can someone give me answer on what to do now. I'm sorry to hear about that! We did face that situation sometimes. There are doctors who are very concerned about HIPPA laws or think employees are trying to have an excuse to get out of work. It's very frustrating. I would sometimes suggest that I call the doctor's office on the employee's behalf to confirm with them that this is okay. Some doctors are very stubborn and arrogant. Maybe you can have an HR member call the doctor on your behalf to confirm with them, but HR members aren't always so proactive. Really it comes down to convincing the doctor. 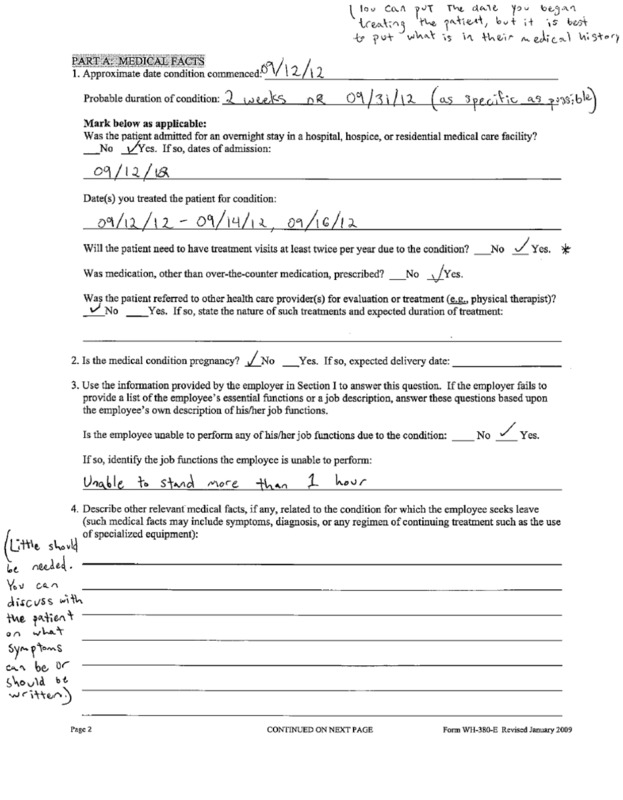 What about a situation where a physician refuses to fill out FMLA forms when they are for the caretaker and not the patient? My grandmother has advanced dementia and requires round-the-clock care. My grandfather and my mother are her primary caretakers. However, my mom needs to use intermittent FMLA leave so that she can be off at least one weekend day and so that she does not work past 8 p.m. on the nights she has to go to her parents house to help with bedtime. My grandmother's physician refused to fill out the FMLA paperwork since my mom is "not the patient." It's a very strange situation. As an attorney who deals with FMLA claims somewhat regularly, this baffles me.